The brilliance of making your own marinated olives is that you alone customize the flavor of the dish. Take out an ingredient here and add one there… you have your own special blend! This recipe can use black or green olives – or both. Coarsely chop the lemon and orange zest and transfer it to a medium-size saucepan. Add the olive oil, rosemary, thyme, bay leaves, garlic, and pepper to the pan. Heat the mixture over low-medium heat for 6 minutes, just until the oil is hot. Remove the pan from the heat and allow the oil to cool to room temperature. 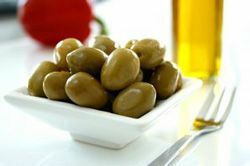 Place the olives in a large jar or glass container and pour the oil mixture over them. Cover the jar tightly with a lid and store in the refrigerator several days before serving. The olives will keep for up to 2 weeks store in the refrigerator.